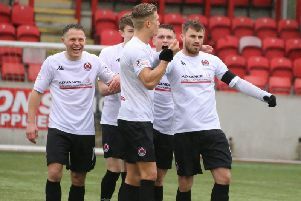 Clyde left Borough Briggs with as comfortable a three points as they are likely to get away from home this season, beating ten-man Elgin City 3-1. Goals from David Goodwillie and substitute Ross Lyons came either side of a Craig Beattie own goal, with Elgin captain JP McGovern also seeing red in the first half. The game started at a ferocious pace, with Clyde imposing themselves on their hosts right from the off. Kristoffer Syvertsen was first to have a decent chance for the visitors, nodding David Goodwillie's delivery wide at the near post. Clyde's early dominance paid off after 13 minutes. The ball was neatly back-heeled into the path of Syvertsen and he knocked it onto Goodwillie, who was scythed down for a stonewall spot-kick by Rabin Omar. The 29-year-old got up and took the penalty himself, rolling it into the bottom-right corner and sending Elgin keeper Thomas McHale the wrong way. Five minutes later and a speculative effort almost doubled the lead for Danny Lennon's side. Mark Lamont picked the ball up 30 yards from goal and crashed an effort again the crossbar. Just after the half hour mark, two moments that effectively ended the game as a contest - an own goal by ex-Celtic striker Craig Beattie and a red card for City captain JP McGovern. John Rankin's ferocious delivery on 32 minutes was headed past his own keeper by Craig Beattie, before JP McGovern was sent off for throwing the ball against Raymond Grant's back. A terribly harsh decision. Clyde set about putting the ten men to the sword and Goodwillie missed a big chance moments after the red. Lamont played him in but he delayed his shot before firing against Beattie. Elgin's best chance of the half came moments before the whistle, McLeish had an effort blocked before laying off Brian Cameron who fired over - the obvious deflection wasn't picked up by the official, somewhat stoking the flames in the home end. Into the second half and the man advantage Clyde held was clear to see with neither side creating clear-cut chances. Clyde's first chance of the second half came on 63 minutes, with Goodwillie cutting inside, past two, before firing a sliced effort wide. Danny Lennon made three substitutes, with Karim Belmokhtar and Ross Lyons coming on before Ally Love appeared 10 minutes later. And those three combined for the next chance, with Love's free-kick chested by Belmokhtar for Lyons to fire wide. It was one of those subs - Ally Love - that made it three just minutes later. Lyons was again involved, before Goodwillie knocked across goal for Love to head in unmarked from three yards. At the other end, Shane Sutherland was also unmarked as he grabbed an Elgin consolation in the last minute. Jordon Lowdon's corner was cleared back to him, before the left-back landed his second effort on Sutherland's head. Picking the ball out of the net was the first thing Blair Currie had to do in the second half. A comfortable afternoon for Clyde, who move within five points of leaders Edinburgh City, who were in Irn-Bru Cup action.